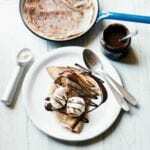 This indulgent dessert remains quick and easy by dent of the use of chocolate spread and chocolate dipping sauce, although the pancakes are made from scratch and are the work of a minute. 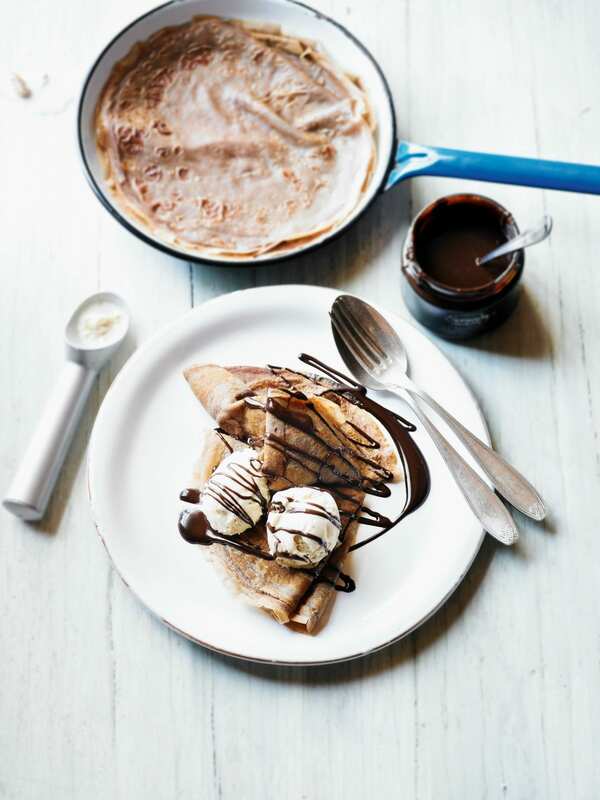 Naturally, you can pair the chocolate pancakes with any time of ice cream that floats your boat. Place the flour in a large bowl and make a hollow in the centre. Whisk the egg into the flour then gradually whisk in the milk to form a smooth batter. Warm the chocolate spread in the microwave for 30 seconds and mix into the batter. Heat a little oil in an 18–20cm frying pan (or pancake pan). Pour in half a ladle of batter, spread to thinly coat the base of the pan and cook for 1–2 minutes. Flip over and cook for 1 minute. Repeat to make 8 pancakes. Spoon a ball of ice cream in the centre of each pancake, fold over the sides and place on the plates. Warm the dipping sauce in the microwave for 30 seconds, drizzle over the pancakes and serve.